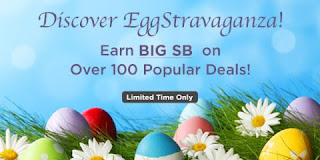 The Target Saver: Swagbucks: Discover EggStravaganza! To celebrate the beginning of Spring, Swagbucks is offering HUGE SB on Discover offers, so now’s the time to try out some of these products and services! If you're not familiar, Swagbucks is a site where you earn points (called SB) for checking out deals and products from different companies. Then you redeem those SB for gift cards to places like Amazon, PayPal, Starbucks, Target, and many more. You can also earn SB for things like shopping online, taking surveys, watching videos, and searching the web!